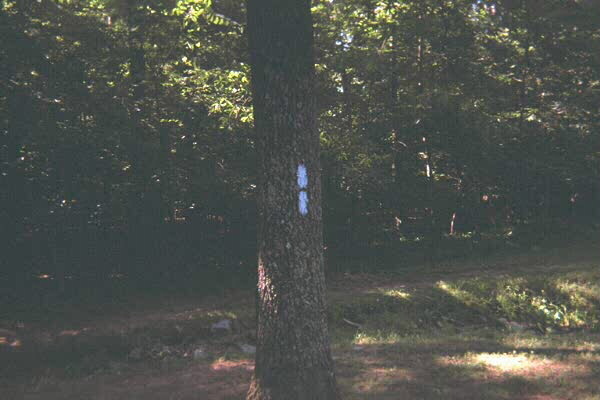 Saturday, 9/21/96- I arrived up at Bull Run Regional Park Campground near Centreville, VA not knowing who would be showing up to camp tonight or hike tomorrow. But I knew that I would hike the 7.2 miles on Sunday morning to Hemlock Overlook Regional Park near Clifton, VA regardless. Rasool Nafisi and his son Mike showed up and I was glad that I would not be hiking solo. 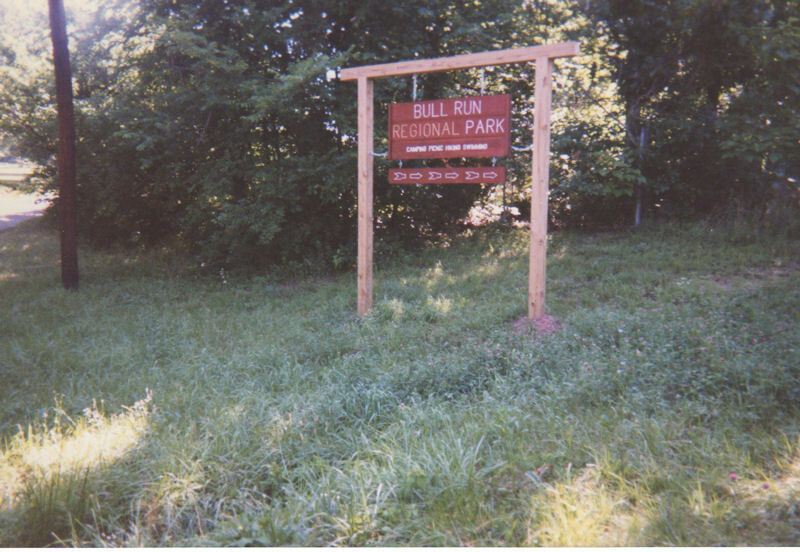 At left, Bull Run Regional Park Entrance Sign. By Mike Calabrese. Mike went and tried fishing in Bull Run while his dad and I set up the tents and cooked some dinner. Rasool N is a great cook. He brought some fantastic homemade bread and some of the best homemade salsa that I have ever had! We ate after his son came back from fishing (he didn't catch any), sat around and talked for awhile, and then we retired. There was a chance of rain in the forcast. I put up a tarp over my tent but Mike didn't put his rain fly on. In the middle of the night it started raining like cats and dogs. The tarp above us would fill up with water, then overflow onto the ground. Unfortionately, it would overflow into Mike's tent. I heard an obscenity yelled in the middle of the night. Then I heard Mike outside his tent frantically trying to put his rainfly on his tent. While he was doing that the tarp overflowed and splashed a bunch of cold water all over him. Bummer! At the same time Rasool N's tent was filling up with water too, so he crawled in with his son, since his tent was dry at one end. At least these two toughed it out. During the storm and around 2:30am alot of people were leaving the campground, probably with waterlogged tents hastilly thrown into their vehicles. Sunday, 9/22/96- The rain stopped in the early AM. Everything was saturated with water. I got up around 7am, got dressed, ate, took down my tent and tarp, and was ready to start hiking around 8:45. However, Rasool N and Mike had a rough time getting up. At right, Western terminus of the BR-O Trail. By Mike Calabrese. I went to the trailhead to see if anyone else would show up. No one did. So I came back to the campsite and Rasool N and Mike were just getting up. They ate breakfast and packed. Mike opted out of hiking but said that he would shuttle us to the start of the hike. By the time we actually started the hike at the western terminus of the Bull Run-Occoquan Trail it was almost 12 noon. Once we got started things went well. The trail was very muddy and had alot of standing water on it. Rasool N listened to books on tape on a walkman while we were hiking. I listened to the Redskins-Rams game on mine. I sampled a new energy bar that I got at GNC called a Steel Bar. I must admit that it tasted very good and gave me alot of energy. The weather was great, a little overcast and in the 70's, perfect hiking weather. We only saw one other person on the trail the whole time, a lone mountain biker. We passed a neat civil war earthen fortification. I'm amazed that it has withstood time so well. We lost the trail at one point but hiked along the Bull Run Creek Bank and caught it again. We got to Hemlock Overlook Park at around 4pm, just as the Redskin game ended (they won 17-10!). It was a good hike and, except for the rain, a great campout. Bull Run Regional Park Campground has nicely spaced, wooded sites and the facilities were clean and modern. The price to camp was reasonable, too. The Bull Run-Occoquan Trail is a great hike. You can shuttle cars to within any of the 4 parks that line this trail and hike between them or just do a short up and back hike. I would recommend this trail for any hiker.